SGPT: Tell us about yourself? Smith: The truth hurts, but the pain is only temporary….. I’m a 45 year old male with some health issues that have come up in the last two years because of weight, and not exercising regularly. (High blood pressure and water retention ) Both curable/controllable with proper nutrition, exercise, and some temporary meds from my doctor. I’m now on the road back to health, feeling great, and dropping weight by the day. To anyone who is going to read this, YOU CAN DO IT TOO!! SGPT: Did you have an athletic background growing up? Smith: I played a little football and was an average kid, I guess. Bicycles, motorcycles, gym once in a while. But as I grew up life took over and a job, the house, and normal every day things take up my time now. SGPT: How did you train for the Spartan Race event? Smith: I followed SGPT workouts on Facebook as best I could, ate well, made sure during every workout I pushed myself to improve, And asked Coach Brad questions about anything else I needed to know. SGPT: Tell us a little about the event? Where was it? Smith: It was the Battlefrog OCR 8k run in Las Vegas, NV. 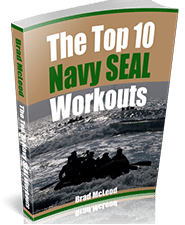 The obstacles were Designed by Navy SEALs to be challenging but not impossible. You just have to keep the attitude that you can do it and try your best to get through it. 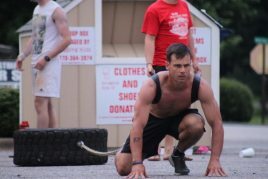 ( NEVER QUIT ) If you can’t get through an obstacle after giving it your best shot, you can give them 10 eight count burpees instead and then continue on to the next one. We had a great time doing the course and all the staff were fantastic. I would recommend checking them out if you haven’t already. They really make it challenging and fun all at the same time. But don’t go in thinking it’s going to be a walk in the park, you need to do some training for any OCR. I trained and still ended up doing burpees. But it pushes you to know where your weak points are so you can come back the next time and do better. Train hard, challenge yourself, build on your weak points and then come back and crush it!! SGPT: What was hardest part of the event? Smith: Every obstacle was challenging. But the rings are no joke!! Core, grip strength, and determination is what is needed to get through those!! That was the hardest for me cause I need to work on my grip strength, but don’t take the rope climbs lightly either it requires the same grip strength, core, and can do attitude. Just an FYI…There is more then one of both! So train, train, train!! SGPT: What is one thing you wish you would have done to get ready for the event? Smith: In my case it would have been have more time to train. When I saw the race was coming to Vegas, I think it was like 33 days before race day. I reached out to Coach Brad and got the help I needed in the time I had to prepare and just went for it. I dropped 25lbs, and built enough muscle to get me through the whole 8k run and all the obstacles plus didn’t miss any burpees ( I Did them all with a smile cause I put in the work and earned it and i was proud!!) I know i sound like a broken record, I must have thanked Coach Brad and SGPT a hundred times but i don’t think I could have done it without the help. So thanks again for answering my questions and pointing me in the right direction, from the bottom of my heart I truly appreciate everything he has have done for me. All the questions you have answered for me, and all the drive you have given me to not quit and to get fit. SGPT: Any tips for up and coming athletes that want to do the Battlefrog? Smith: Find someone that can answer your questions when you have them like I did. Eat well and train. Train hard, train often…..But train. Eating well alone will not get you through it, you must train!! SGPT:What kind of running shoes did you use for the event? Smith: I used a pair of New Balance 610v3′s all-terrain. They’re like a trail running shoe with an aggressive tread pattern and they wick water pretty fast. There are many running shoes out there but for an OCR you want a shoe that gives you a good grip cause your going to get wet and muddy at times. You want something that will shed water quick but grip well wet or dry. When looking for shoes keep that in mind. SGPT:Did you use double socks or body glide on your feet to prevent blisters? Smith: I didn’t, but I would say if you have problems with blisters or think you may have an issue do whatever it takes to counter it, because a blister would be no fun on an OCR. SGPT:What is your next big event? Smith: I’m training for Bonefrog next, I have a lot of SEAL friends from working at Naval Special Warfare for many years myself, so I will always show my support there first. But from there I’ll make my rounds I’m sure and try to tackle as many as I can. SGPT:What book are you reading now? Smith: I’m a huge fan of fine art, So i’m reading Dali By Salvador Dali.